Amanda at Vintage Glam just emailed me about a printable 2009 desk calendar she made. Trim out the sheets and put them in a jewel case stand, or mount them on colored paper and hang them on your bulletin board. Get the calendar PDF here. 'Bout time you get a new post on here. Yer slippin', girl! Oh good. That's a relief. luv your blog, alwaz ahead with all these things :) luv it!!! Thanks Jess for sharing with your readers! I always loved your download section and I'm happy to give back! So cute!!!!! I love it..
so cute! I love your site. One of my daily reads! Thank you - sooooo cool! I was wondering if you added the border after you printed them. I downloaded the file but they don't have borders. Maybe I downloaded the wrong one. Nope, that's it. She mounted her sheets on colored cardstock. Thanks! This would make a very cute stocking stuffer. Ooh, I love Vintage Glam! Thanks for sharing! 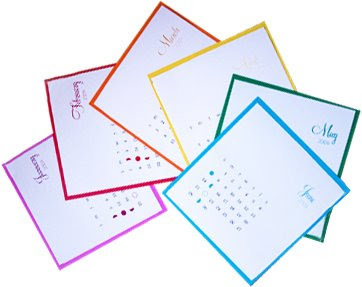 Please oh please, I want a 2010 CD printable calendar like last year. I have looked everywhere. I so enjoyed putting my own pictures on each month. I've hunted everywhere and can't find it. I figure if anyone can, you can. Thanks for all the great ideas throughout the year.